Winter is officially here. The calendar tells us that and the weather outside is a realistic reminder. Here are some quick reminders of the season we are in and to be mindful of our all our plumbing, inside and out! HOSE BIBS: By now the hoses should be disconnected from all hose bibs including the one in the garage if you have one. Be sure to check and make sure that any of your hose bibs do not have a drip or worse yet an icicle hanging from it. If so the hose bib needs immediate attention! This is a sign of a bigger issue. FROZEN PIPES: As our weather turns bitterly cold and the wind is howling, “What can be done to prevent frozen pipes?” We get this question all of the time. Here are some helpful hints. The earlier this is done, the better. Keep in mind this isn’t a full proof solution. As there are a myriad of variables that can change the outcomes. First and foremost you can bump up your temperature in your home. Open cabinets of the effected area, make sure doors are open to the room to insure proper airflow. If you have a known problematic area, may we suggest, insulating the pipes. Place an electric heater in the room, to help keep the area warm to ensure freezing does not occur. 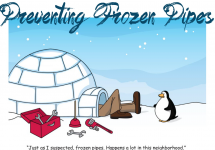 If your pipes are already frozen you may need to call the professional plumbers at Micro Plumbing, Inc. We are always available for assistance. Micro Plumbing, Inc. Big or Small, We Do It all! 402-895-1212. Winter is officially here. The calendar tells us that and the weather outside is a realistic reminder. Here are some quick reminders of the season we are in and to be mindful of our plumbing inside and out.